In her introduction, Jennifer MacArthur, CPB Filmmaker Forum Producer, acknowledged her initial reluctance to take on the topic. "I felt like the conversation around this area had been stalled," she admitted. "But what's exciting to me is to see the conversations happening out in the world, between young people and older generations. The conversations are changing and the way we're thinking about diversity and inclusion is changing." The forum started with the panel "Beyond the Black/White Divide," featuring Ramona Diaz (The Learning, Don't Stop Believin'), Carlos Sandoval (The State of Arizona) and Danielle Jackson, co-founder of the Bronx Documentary Center. The panel was moderated by Angie Chuang, associate professor at American University, and was a continuation of the #OscarsSoWhite conversations that emerged following Chris Rock's controversial Oscars monologue earlier this year. Chuang said that she was "personally conflicted" during the Chris Rock monologue. "He was having this totally subversive moment where he was pushing back against a white paradigm, and in doing so he made a pretty crude and not funny anti-Asian American joke," she noted. "And it brought back a familiar conversation: When we [people of color] push back, when we gain something, does it have to be at the expense of each other? Is the slice that we get only so big, and do we end up fighting each other for it? And who sliced up the pie this way, anyway?" The panel also built on the question that journalist Jose Antonio Vargas raised in Medium.com when he wrote that "when the media does talk about race…it's always white vs. something. But what about the conversations people of color have across and within their communities?" The panelists said this topic is particularly pertinent as the United States moves toward a "majority minority" population, and at various times the panelists called the topic "fragile," "private" and "dirty laundry," but agreed that documentary and public media are the best places to have these conversations. Discussing the dynamics in the neighborhood where she founded the Bronx Documentary Center—based in one of the fastest growing boroughs of New York City, due to an influx of immigrant and refugee populations—Jackson explained the considerations they take while making programming decisions: "What happens when these groups come together and intersect, [with] their perceptions or misperceptions of each other, has almost nothing to do with white people or white people coming in. There are all kinds of internal relationships that we find ourselves situated in the midst of." Sandoval described the tension in how he perceives his role as a filmmaker and in his responsibility as a "gatekeeper," a term the panelists used to describe decision-making ability in programming, awards and funding. "We have these contradictory notions going on, in terms of the sound bite—in my role as a filmmaker who has chosen to tell stories that are about the Latino experience and my need to stay true to that, and in my role as a gatekeeper, making certain to be intentional about being inclusive. I know those are two very opposing notions and I don't know how to reconcile them, but they seem to me to both be true." The panel was followed by the keynote, W. Sean Kelly, the Global Lab Leader at Deloitte and co-author of the paper "What if the Road to Inclusion is Actually an Intersection?". He described the concept of "intersectionality," an idea that was introduced in the 1980s by Kimberlé Crenshaw to address the "multiple avenues" by which discrimination can occur. The term is also used broadly to describe the multiple social identities everyone possesses. Like the corporate world, Kelly noted, the relative lack of financing for women and minorities "is not an issue of talent." Citing the diversity of film schools, he added that "it's really about making sure that talent works its way up the ranks." 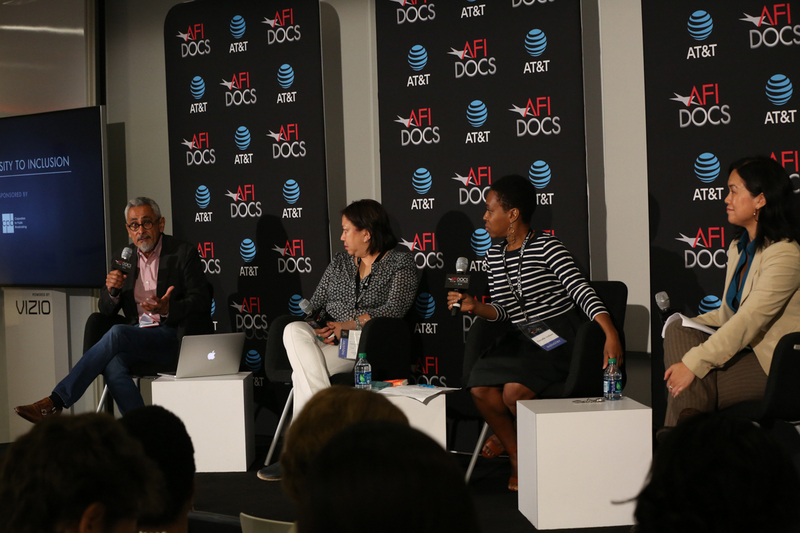 Friday opened with the presentation "What #OscarsSoWhite Can Tell us about the Film Festival Circuit." Caty Borum Chattoo, co-director of the Center for Media and Social Impact (CMSI), presented findings from two recent CMSI studies, "The Journey to the Academy Awards: An Investigation of Oscar-Shortlisted and Nominated Documentaries (2014-2016)" and "Diversity in Independent TV Documentaries: Is Public TV Different? 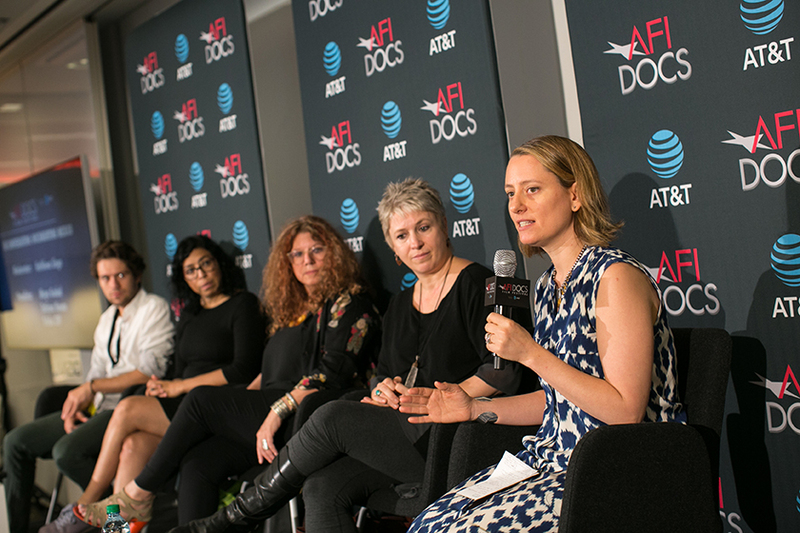 "The two studies examined the perception that documentary offers more opportunities and recognition than fiction for women and directors of color, an idea that has been circulating in trade publications. "When we started these studies, we thought we would be telling a celebratory story," Chattoo explained. What they found, however, was much more complicated. Describing the disconnect between festival inclusion and broader career opportunities for funding and recognition, she noted, "It's not just about the award. It's a surrogate for how we can have sustainable careers in this industry." Chattoo explained that while there have been "incredible moments" of women and minorities directing films that have received recognition and been effective tools of social change, it's important to "not assume change because we have these anecdotal moments. If we're not looking at the data and examining what's happening systematically, we're going to miss the pattern." Next, MacArthur put funders in the "hot seat" about diversity efforts, chatting individually with Bonni Cohen, co-founder of Catapult Film Fund; Amy Halpin, director of filmmaker services at IDA; Jeff Hardwick, senior program officer for the National Endowment for the Humanities; and Eliza Licht, VP of content strategy and engagement for POV. Halpin recalled a recent round where she and her colleagues realized there were not enough applicants of color. "It was surprising how relatively easy it was to increase those numbers with just a little strategic outreach," she noted. "If you care to do it, and you can make the effort to do it, we realized it's actually fairly easy to find those projects; there are a lot of them out there and a lot of them are really good." In the final panel of the day, MacArthur sat down with Sylvia Bugg, VP of diversity and TV content at CPB; and Marie Nelson, VP of news and public affairs at PBS, both of whom echoed a similar sentiment about finding talent outside the status quo. "I think there is incredible talent, and sometimes what ends up happening is that there's just a default," Nelson said. "The only way that you really disrupt that pattern is to expand the network." 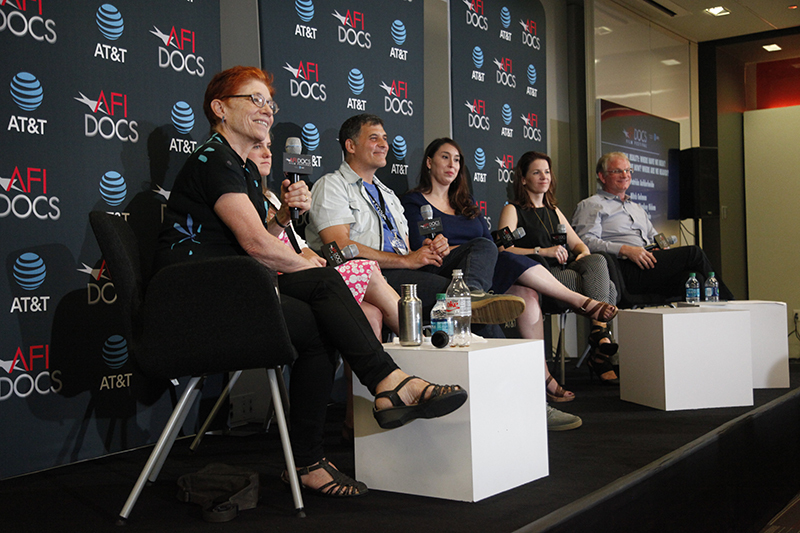 Saturday's first panel, "Big Ideas, Small Packages: Short Format Documentary," presented in conjunction with Harber's Studio, was moderated by Jon Gann, the founder of the DC Shorts. 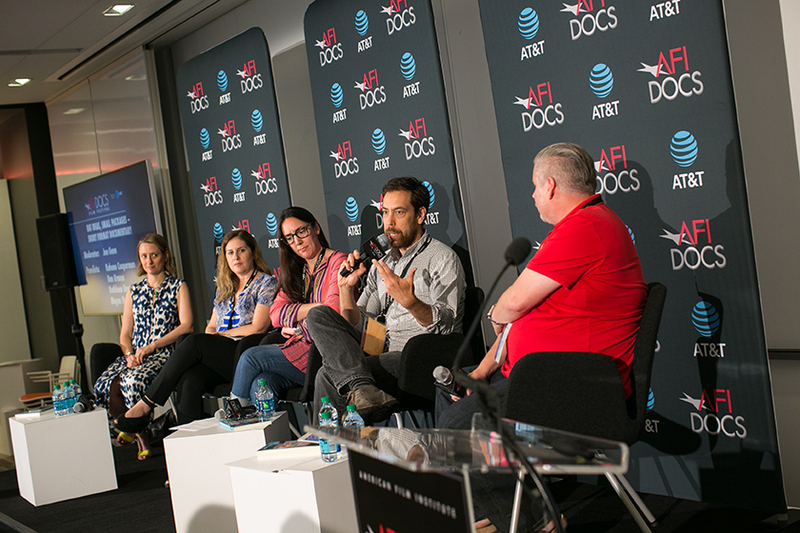 He was joined by panelists Megan Mylan (Taller than the Trees, Smile Pinki); Dan Krauss (Extremis, The Kill Team); Kahane Cooperman (Joe's Violin, The New Yorker Presents); and Kathleen Lingo, executive producer of The New York Times Op-Docs. Mylan described the short form as "freeing," both in terms of "the range of stories you can tell" and because there "isn't the same need for longitudinal [storytelling] or character transformation." The filmmakers on the panel agreed that working in shorts was also a practical decision that allowed them to make films on smaller budgets and shorter time frames. 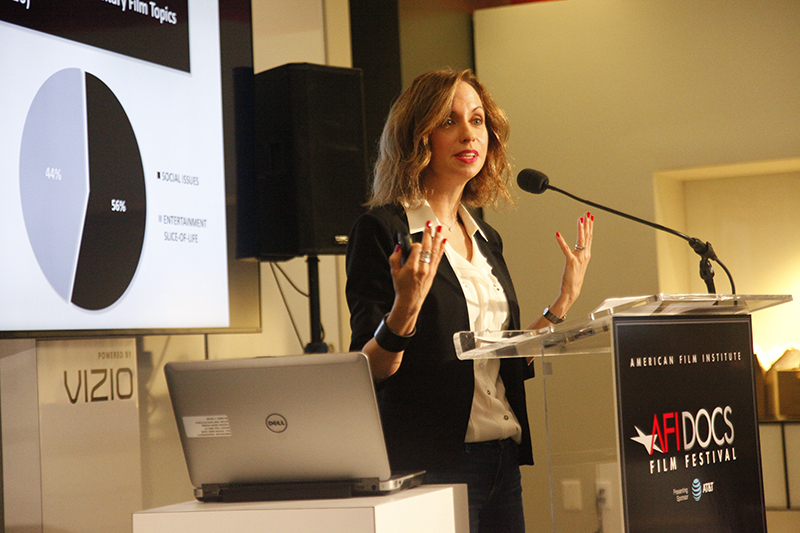 Lingo added that filmmakers are thinking "shorts first" because there are so many more outlets and opportunities. "Shorts just make sense with the moment that we're in," she concluded. Lingo moved into the moderator seat for the next panel, "In Conversation: Documenting Mexico," which was based on a yearlong series of Op-Docs films by Mexican filmmakers. Lingo called her panelists "three stars of the Mexican documentary scene": Tatiana Huezo (Tempestad), Maya Goded (Plaza de la Soledad) and Trisha Ziff (The Man Who Saw Too Much). All three had directed films that addressed the ongoing violence in Mexico in some way. Ziff raised her concern about showing the films in the United States, particularly during this election season. "It's one thing making our films for our own discourse at home, it's another showing a critique of Mexico in an environment where the dominant media has a perception of Mexico that possibly we are reinforcing," Ziff explained. "Do our films contribute to a more thoughtful, reflective reality? I'm really not sure." The final day focused on a status update for "Year One" of virtual reality. "It's an area that has so many questions," festival director Michael Lumpkin said during his introduction. "And the answer is often, ‘We don't know.'" The panelists praised the camaraderie within the small but growing VR community, agreeing that most are willing to share their "duct-tape solutions" while they figure out how to solve problems, tell stories, and experiment with new technologies such as photogrammetry. "Even the biggest companies are open right now and willing to help," Hidem maintained. "We're all in this together now, because nobody is really an expert yet." Lichtenstein estimated that 60 percent of viewers come out of the experience in tears. "It's such an intense experience for some people," he explained, "that we always try to book 15-minute [viewing] increments, even though the film is only seven minutes. Part of the experience is talking about it." Halfway into "Year One,"Gelman said, the industry's "greatest fear is bad content," and emphasized that there is concern "that unless people create great stories, people aren't going to come to the medium and experience it." Casey Freeman Howe is a graduate fellow at the Center for Media & Social Impact at the American University School of Communication in Washington, D.C.